The Giro d’Italia starts in ten days’ time and just as there’s a season-long calendar of all the major men’s and women’s races to download, here’s the stage by stage Giro ical for your phone or diary ahead of the grande partenza in Sardinia. The calendar keeps proving surprisingly popular for each grand tour. It lists each stage along with the distance plus a stellar rating to indicate the strategic importance or likely entertainment. For a calendar of all the main pro races in 2017, including the free iCal, visit inrng.com/calendar. Not sure of the significance of the photo, but I notice some of those riders are not wearing helmets. 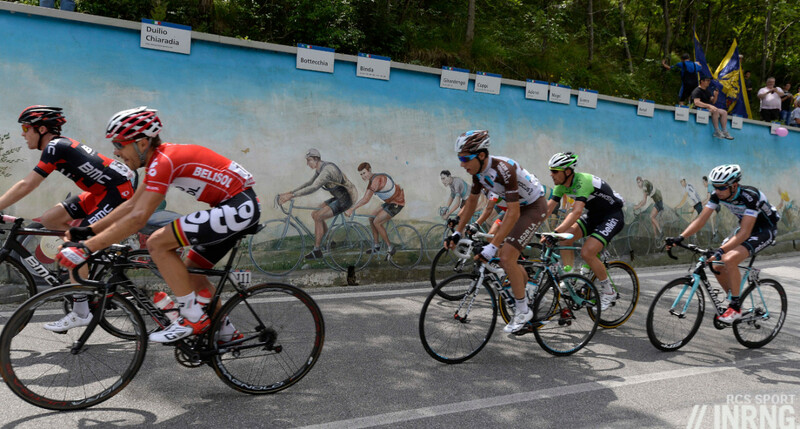 It’s a mural commemorating past champions like Bottechia, Binda, Giradengo etc. In case anyone wonders it’s near Bordano in Friuli. I hope the remark is in jest – I was in Denmark recently and believe it or not many users of bicycles were not wearing helmets either and they seem to have survived quite well. Look more carefully at the picture, Andrew. Your podium is a bit risky I’d say – Thomas hasn’t proved himself over three weeks, neither has Dumolin… I think both are good bets but with the increased gradients of Giro will their gains in the TT really be enough to counter Quintana in the high mountains? Also given that we’ve seen Zakarin and Landa last over three weeks they’d have to be on that level also even if Thomas has shown the form, he’s unproved over three weeks, as to an extent is Dumoulin. I think your podium could be right, but it wouldn’t surprise me at all if it were Quintana, Landa, Nibali, or Quintana, Kruiksijk, Zakarin…. Spose that’s what makes this Giro interesting. Even if I still think Quintana will win… he’s going to take minutes out of the others on the climbs. Thanks for doing this again – it’s really useful to have. Very interested to see if Kruijswijk can repeat last year, minus the unfortunate crash amongst the snow. He was so strong up to that point on stage 19 with 3 minutes over 2nd place Chaves and a whopping 5 minutes over Nibali at that point. Similar, relatively low key, build up again this year, presumably to try to repeat the formula, so it’s hard to tell. Also looking out for how well Dumoulin and, with less expectation, Dennis can climb. Thanks for another very useful GT calendar. Yeah – Dennis will be very interesting… what a shocker for TVG if he’s outdone by Dennis – will be going the way of Gesink and will be very hard to see a way back for him… although Mollema up’d his standings after most had forgotten about him. Any which way, this Giro is massive for TVG. Agree Dennis could leapfrog up the BMC value chain quickly. TVG might need more time on the couch! I really doubt Dennis will stay anywhere close to the leaders on the long climbs and I think TVG will have no problems staying in front of Dennis on the climbs. It’s going to take years before Dennis will be able to climb well. FAO UK readers, hour-long Giro highlights will be aired every evening at 10pm on the Freeview channel ‘Quest’. That’s a quite strange home. To mix the ITV4 Team up with odd-ball Combat Dealers and those contemporary rag and bone men of Salvage Hunters. Last year (2016) Quest had the WRX broadcast rights. So they have history providing sports coverage, and it’ll probably be Eurosports coverage re-broadcast on FTA TV. Of those ‘pretenders’ to the Grand Tour throne I don’t see Thomas holding it together for a full three weeks. I find Pinot flaky. The likes of Zaharin and Landa tend to lack the required consistency. I have a sneaky feeling Dumoulin, for no other reason than I like his style, and Kruiswijk has a great record at the Giro. One prediction I will make with absolute certainty is that Mario Cipollini will, at some point, confirm to anyone listening that he’s still Italy’s top sprinter (at the age of 50)! Quintana to win, for me. Just to clarify an earlier comment, the hour long nightly highlights to be shown on Quest are a Eurosport production (Quest is a ES subsidiary channel) and it is these that will be fronted by triple jump world record holder Jonathan Edwards. This will be separate from any ITV production. Technically a Discovery subsidiary, sorry.